COLE KPEKAWA was the surprise match-winner as Pompey’s reserves defeated Peterborough. And first-team coach Paul Hardyman believes the youngster possesses a bright future. The 18-year-old has not made Andy Awford’s past two squads, having struggled to shine since his loan arrival from QPR. Regardless, the defender will remain at Fratton Park until the end of the campaign. Yesterday, Kpekawa turned out for Hardyman’s reserves and headed home Ben Close’s corner in the 18th minute to seal a 1-0 victory at Furze Lane. The reserve boss is confident the youngster has the talent to progress in the game. Hardyman said: ‘We played Cole in the first half as a left-back in a four and he did well, getting forward a few times to put in some decent crosses, and his defending was good. ‘In the second half we moved him into the centre-half role and he looked comfortable there as well. ‘The lad certainly has a bright future, but the difference between development football and the first team is massive. ‘People might not think it but there’s a lot more that goes on and your awareness has to be sharper. ‘I think Cole found it difficult in the first couple of games, but that is part of his learning. ‘He is such a big lad and so athletic you think he is older, but he is an 18-year-old, a first-year pro. 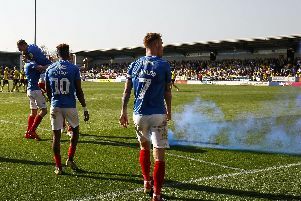 Kpekawa has made two starts for Pompey, although was included in the 18-man match-day squads for Carlisle and Plymouth.